We get asked all the time what’s the fastest way to lose weight. Although going keto is our initial answer, people want to know exactly what to do. Of course there are a lot of paths someone can go down but we wanted to outline one way that works for us to get the fastest results possible. 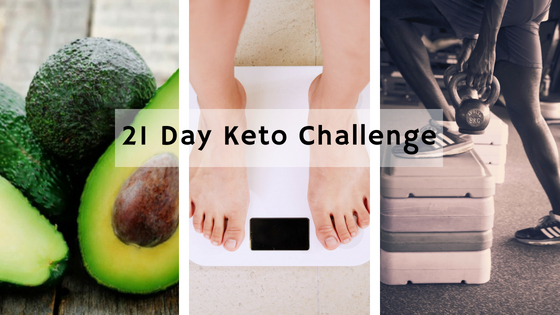 This blog post will follow Jon’s 21 Day keto challenge that incorporates pure therapeutic ketones, fasting, intermittent fasting, and a complete keto meal plan. Tune into this blog post for daily updates on my 21 Day Keto journey. To kick off this 21 days of keto success the first thing I like to do is a 60 hour Keto ReBoot. This Keto ReBoot is a metabolic reset in a box. It comes packed with everything necessary to go without food for 60 hours while preserving muscle, keeping energy levels up, and depleting glycogen stores, allowing you to get in a deep state of ketosis. Following the 60 hours without any food and only utilizing the ReBoot kit, I’ll then go 19 days with a functional fat coffee for breakfast, pure therapeutic ketones for lunch, and a simple ketogenic meal for dinner. Stay tuned and I’ll share the full meal plan, the shopping list, and all the macros. In order to create the fastest fat loss possible, I’ve chosen to keep my daily caloric intake less than 1,000 calories as outlined below. At my age, height, and weight in order to maintain weight, it’s recommended I eat 2490 calories a day. By creating a 1500 calorie/day deficit before my workouts this allows me to sustain a higher level of fat loss as my body dips into my fat reserves for those extra 1500 calories. Once I add in exercise this will add another 300-500 calorie deficit. It’s important to note that you can do this effectively while preserving muscle only while supplementing with pure therapeutic ketones. Starting off day one is very simple with the Reboot Kit. Simply follow the schedule below, drink lots of water, and don’t give in to the habit of eating. Day two is always the toughest for me. My body was definitely in the cleansing mode. I spent a lot of time making trips to the restroom, but this is how I know I’m clearing out all the junk and getting my body reset for awesomeness. Woke up feeling great. I went for a 1.6 mile run at 5:30 am and was high energy most of the day. I measured my blood ketones and it was at 5.3. I did start to get bogged down before dinner and you could tell the hangriness was kicking in as the day wore on. Eating my first meal in 72 years was a definite treat I’ve never had such a great tasting salad! I thought by this point I would hungrier than what I was. Surprisingly enough I was able to sit through two lunch meetings at work where lunch was provided and had no issue passing up the food. My energy level towards the evening right before dinner was down a little but I’m attributing that to the fact I only got 5 hours of sleep the night before. I made sure to get in the bed earlier this night because good sleep does contribute to a healthy body and continued weight loss. Dinner – Grilled chicken, brussel Sprouts with bacon cooked in MCT oil topped with Kerrygold butter with one avocado on the side. Dinner – 1/4 lb Bacon Cheeseburger on a bed of lettuce with a side of mashed cauliflower and an avocado.